Former president George H.W. Bush in Houston on Nov. 5, 2017. George H.W. Bush was admitted earlier this week to Houston Methodist Hospital for an infection in his bloodstream. Spokesperson Jim McGrath said he will stay in the hospital through the weekend to "continue his recovery and regaining strength." McGrath had said earlier that "his doctors are very pleased with his progress." Former President George H.W. Bush is remaining in his Houston hospital through the weekend to "continue his recovery and regaining strength," his spokesperson said. 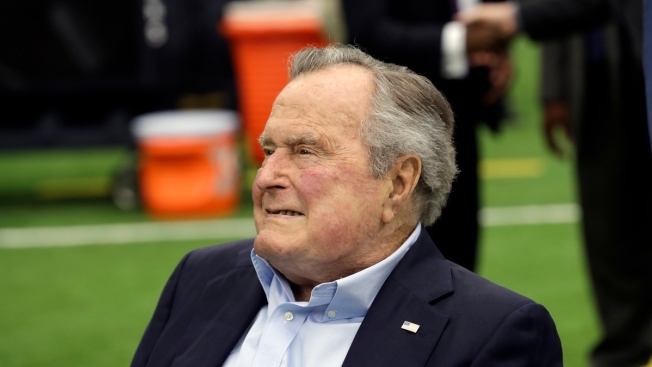 Bush was admitted earlier this week to Houston Methodist Hospital for an infection in his bloodstream, just after attending the funeral of his wife, Barbara. "41 is in excellent spirits, and is looking forward to resuming his schedule and going to Maine next month," spokesperson Jim McGrath wrote on Twitter. He did not provide any other details. McGrath had said earlier that the 93-year-old's doctors "are very pleased with his progress" and that additional updates would be issued "as events warrant." Bush uses a wheelchair and an electric scooter for mobility after developing a form of Parkinson's disease, and he has needed hospital treatment several times in recent years for respiratory problems.